Everyone experiences brokenness at some point in their lives—a romantic relationship fails, a job ends, a dream dies, an illness emerges. During these times it is easy to focus on our human frailty and to want nothing more than to be whole again. But what are we missing when we overlook the ugliness, fear, anger and vulnerability of being in pieces? The Nityas, or the Eternal Moon Phase Goddesses of Tantric philosophy, teach us that we miss the empowerment of the full human experience and the growth that comes from renewing ourselves again and again. The patron saint of being broken is a goddess named Akhilandesvari, or She Who Is Never Not Broken. She is a goddess from the Shakta Tantra tradition, a branch of Indian philosophy that worships the divine feminine as god. This introduction to Tantric mythology as a contemporary resource for personal and spiritual growth guides you to reach into your pain and ask the larger questions about your relationships, not only with your lover but also with your community and with yourself. 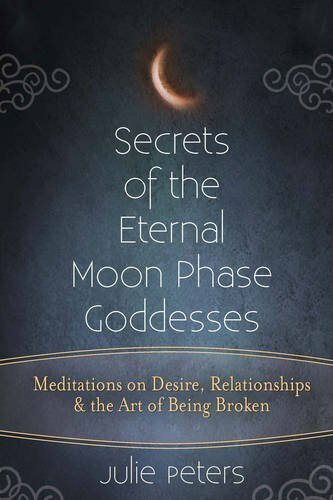 Each goddess (there are 16 in all, each connected to a unique night of the lunar cycle) prompts you to explore some aspect of relationship, such as loneliness, true love, equality, instinct, learning from the other, and learning to be alone. In seeking answers to these questions—supported by yogic wisdom, modern research into psychology and sociology, and nightly meditation and journaling practices—you will find empowerment in discovering who you are and what you truly desire. These goddesses want us to explore who we are right now, not who we could or should be… They want us to be broken, to get whole, and to be willing to break again.